Enclosed fields showing signs of the medieval ridge and furrow system. Wagons leading into the Goods Station at Crook. The Eclipse Silica Brickworks, formerly known as the Woodifield Brickworks, which developed close to the colliery of the same name. LNER Bishop Auckland & Darlington Branch. Signal box controlling siding into the Eclipse Silica Brickworks. New 1930s sawmills on site of the closed Crook Colliery. This is a view looking south-west at the southern edge of the small market town of Crook, which had grown significantly from a hamlet of 193 folk in 1801 to more than 11,400 a century later. The rapid development was almost entirely due to large-scale coal-mining and associated coking plants. When this picture was taken, Crook was still in the throes of the Great Depression, when unemployment rates rose to 34% throughout much of the decade. The town's population reached a peak of 12,706 in 1921, only for it to decline to 11,690 in 1931. One current estimate is 9,547 (2011). 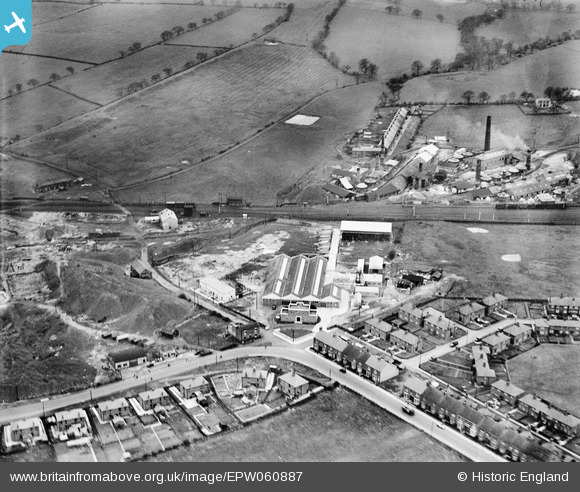 The photograph shows some of the newer manufacturing concerns on the southern outskirts of Crook, which would eventually be developed further as a series of industrial estates in post-war years. The railway was closed in the mid-1960s, part of which was used as a new road layout (A689), but most of the housing remains extant. The brickworks were eventually closed in the 1960s after more than a century of activity and the site is now occupied by the Beechburn Industrial Estate. Apart from that, the scene is largely unchanged, in marked contrast to the former works on the north-western side of the town.